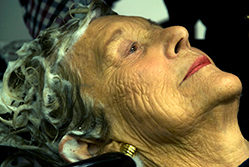 Kaye wound up spending several years taking pictures of older women during their regular appointments at beauty parlors in big cities and small towns across the country. We spoke with Kaye via Skype from her California home to learn more. 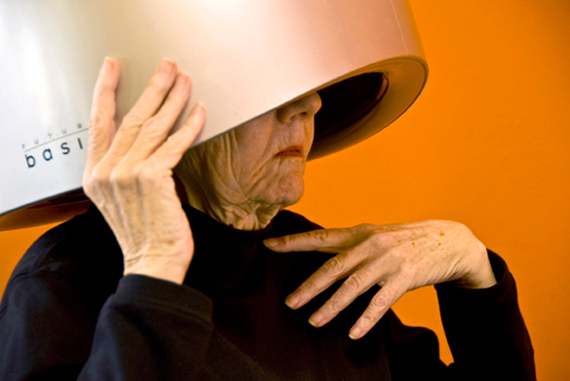 Why do some women have this weekly beauty parlor ritual? There’s some vanity, obviously. But it’s also a kind of necessity for these women, because they’re getting hairdos that they could never reproduce by themselves. Some of these women have not done their own hair – or even washed their own hair – since they were 18 or 19, because that’s when they started going to the salon. 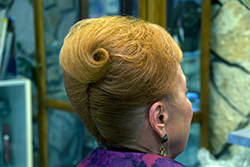 I asked one lady, Vera, who I interviewed in Texas, if she ever missed a hair appointment. She said, “No.” I asked, “What would be a reason that you did miss a hair appointment?” And she answered in a very Southern accent, “I’d be dead.” And then she added: “Even then, my hair stylist Kathy would come to my house and do my hair.” Vera scheduled her hair appointments around her husband’s cancer treatments. She made sure she wouldn’t miss one. Why aren’t newer generations continuing to do this? I think it’s going away because we can do our own hair for the most part. Now we consider getting our hair done to be a luxury, whereas before it seemed like a necessity for some women. It was on their To Do list, just like buying groceries, and their families were supportive of that. There’s still that sacred connection between hair stylist and client. And for these ladies, there’s still a connection with all the other women going once a week. It’s a community. They ask each other, How’s your spouse? How are your children? Your grandchildren? When I was in Alabama, there were five women in this home salon, and the conversation was: “What do you think of the new pastor?” “What are you cooking for the homecoming?” One woman brought vegetables and fruit. One of them was sweeping while the other one folded towels. It’s such a community. It was, and still is. Were classic beauty parlors like this hard to find? I think they’re few and far between. One of the last shoots I did was in Toluca Lake, California, and that was definitely the epitome. All the women knew each other. I mean, if they needed something, they’d all pray together. You could just tell. They felt really comfortable going there because they didn’t feel like outcasts. It was really wonderful. There’s a salon in Santa Monica called Mary Ellen’s where they have the line of dryer chairs still with ashtrays – and the burn marks! And they have tush marks from where the women sat. 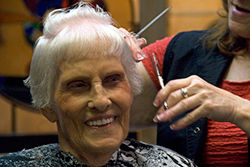 You feel like you’re in the 1950s when you’re there, and Mary Ellen herself is in her 70s and still doing hair. 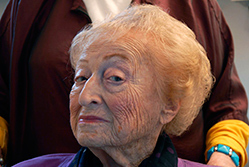 You share on your website about meeting Mrs. Guste, age 88, who lost every piece of jewelry when her house in New Orleans was looted after Hurricane Katrina. She said to you, “Everything is borrowed and when it goes away, it’s time to give it back.” What a wonderful attitude. What other insights did these ladies share with you? There was a woman, Ellen, in New Orleans, and she was talking about how we need more pats on the back. She calls herself the world’s cheerleader and encourages us to say to one another, “You did good.” I thought that was great. I really loved her energy. So many of the women had wonderful things to say about what’s important in their lives. They all talked about the same thing – about accepting and loving what is. These women showed so much courage and they really have a “take me as I am” attitude. When I asked them, “What message would you want to tell the younger generation,” they said, “You are perfect the way you are.” That’s it. What message do you hope to communicate through this series? I wanted to offer an alternative way to look at aging. And the beauty parlor happened to be a great place to do it. I believe that the media has had a lot to do with how we look at what beauty is and continues to. My daydream is to have billboards of older women, you know? Because I think it’s a matter of familiarity. If we start introducing that, I really think there can be a collective change and we can take the ugly out of what we perceive as old. It could give many women, and men as well, the relief that aging isn’t something to dread – that it’s actually something to look forward to. What plans are there for Beauty and Wisdom? There’s going to be a documentary coming out (click here to view the trailer created by Christina Neferis). And I just booked a show at the Griffin Museum in Boston for 2014. 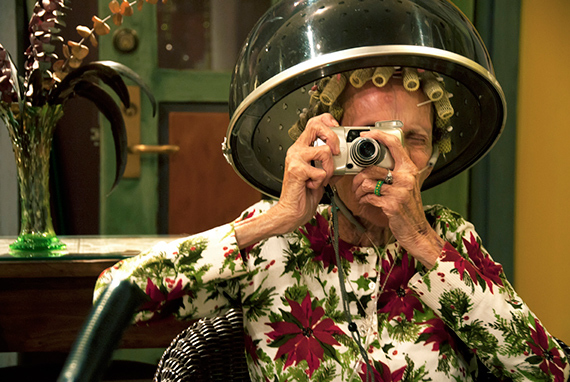 I’m in the final stages of editing a book called “Beauty and Wisdom” with the photographs and 18 essays that I collected from women all over the country on the subject of aging and beauty. Thank you for sharing these amazing women, their stories and yourself. Click here to see more Beauty and Wisdom photographs. Robbie Kaye’s show at the Griffin Museum in Boston runs March 20 – May 11.